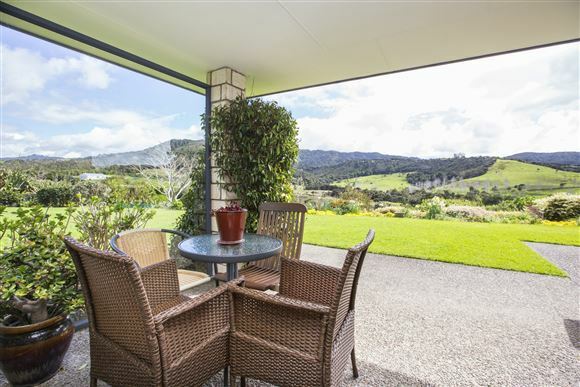 Such a picturesque position is on offer from a well established and lovely maintained Golden Home. This home exudes spaciousness and light, open plan living, kitchen and dining areas, all north facing with living areas and master bedroom framing the beautiful view of the country side and Brynderwyns. 4 Double bedrooms, master with walk n wardrobe and ensuite, large bathroom with bath, loads of storage space, plus internal double garaging and supplementary workshop with room for the mower, tools, fishing rods and toys. Situated on an elevated park like 1.26ha grounds, with a pot pourii of fruit trees olives, shrubs and plantings, this little lifestyle is the ideal family or retiree home. A peaceful and quiet location in an established neighbourhood, all is an easy 10 minutes drive to the Surf Beach, Golf Course, Shops, Café and so much more. Please call for your appointment to view there is much to see and we are more than happy to show you through.